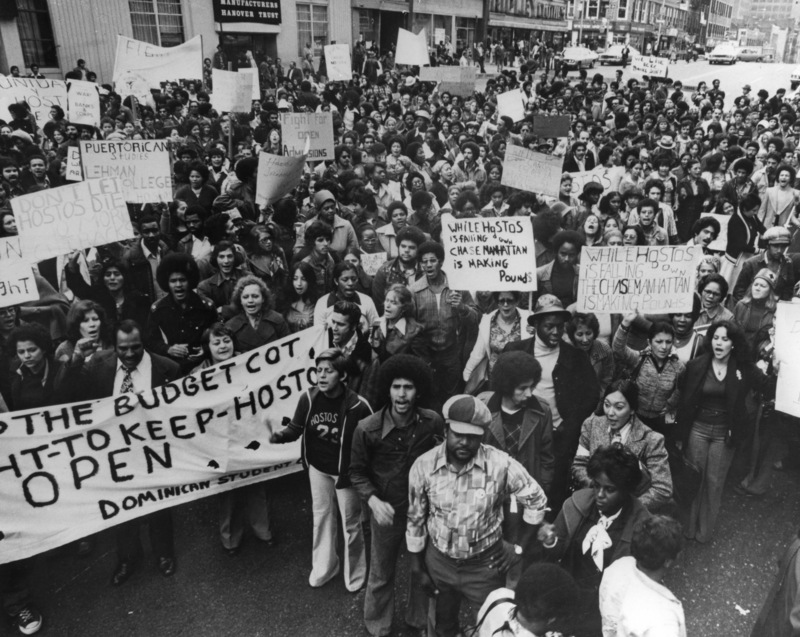 This image depicts one of several CUNY wide demonstrations held in against crippling budget cuts that would threatened Hostos Community College's existence. Students were concerned about the impacts of retrenchment on diversity, Open Admissions and the elimination of key departments such as Nursing and Behavioral Science. In the midst of New York City's fiscal crisis, signs show the political views of the demonstrators. Staged near a branch of Manufacturer's Hanover Trust, signs read: "While Hostos is Falling Down, Chase Manhattan is Making Pounds," "We Live here, Banks Don't" and "Puerto Rican Studies -- Lehman College." Cite This document | “"While Hostos is Falling Down, Chase Manhattan is Making Pounds",” CUNY Digital History Archive, accessed April 18, 2019, http://cdha.cuny.edu/items/show/6232.